I wrote a previous post: “Our ‘Aqeedah is more loved to us…” wherein I clarified that we should clarify our beliefs regardless of the one who either contradicts it on purpose or in error. However, I have deleted it since it is preferable to translate the declaration of the Grand Mufti of Saudi Arabia, Shaikh ‘Abdul ‘Azeez Aal Ash Shaikh and put this in the forefront instead of my words. Pointing to the specific question to the major scholars number (35012723) on the date: 20/07/1435 of the Hijrah wherein the book: Al Maqalaat Al Athareeyah in refuting the doubts and rebelliousness of the Hadadis, written by Dr. Rabee’ Ibn Haadi Al Madkhali was attached. For your benefit, many such verdicts have been issued beforehand by the Permanent Committee in answering such an issue of which a copy of it is attached and it is sufficient insha allah in refuting such ideologies. May Allah guide all toward that which he loves and is pleased with and he hears and answers. This entry was posted in Brotherly advices., Methodology of the Salaf, Salafi Publications. Bookmark the permalink. ← Declaration of the Mashayikh, notables and sons of Dammaj. 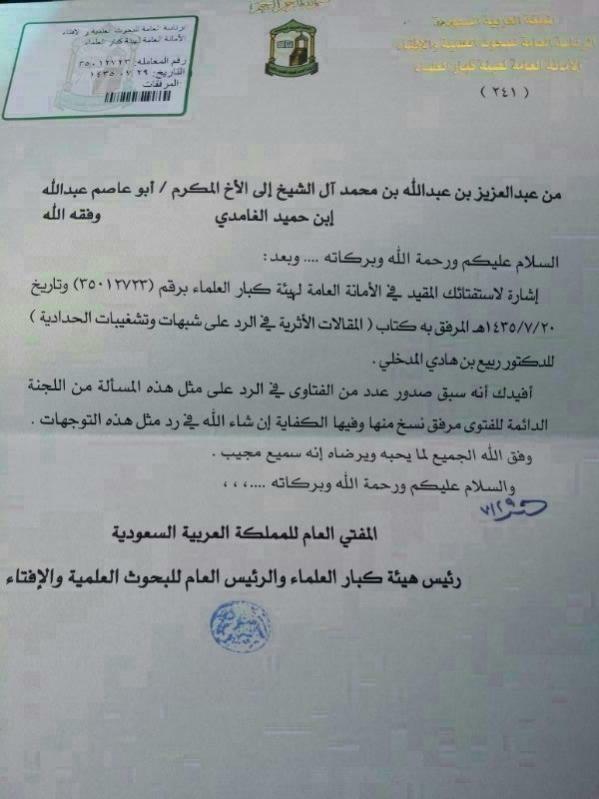 For those who don’t know why this declaration was made by the Grand Mufti, it is because Sh. Rabee’ demonstrated with his statements that a person can enter paradise without doing any actions and that such a person is not a Kaafir [which is of course incorrect]. It is in his post “أحاديث الشفاعة الصحيحة تدمغ الخوارج والحدادية القطبية” and likewise in the book: “Al Maqalaat Al Athareeyah in refuting the doubts and rebelliousness of the Hadadis” which was handed to the Lajnah.